​£105 per day within 15 miles of Perth. £125 per day more than 15 miles of Perth. £30 extra for overnight hire. The Dragon Age Commercial Bouncy Castle, Once a fierce beast and now an amazing design for kids to play on and have fun. This popular design is a big hit with the kids at shows and events due to its high quality design, safety features and most of all its unique colour scheme and medieval dragon design. £105 per day within 15 miles of Perth. £35 per day within 15 miles of Perth. £45 per day more than 15 miles of Perth. £20 extra for overnight hire. Suitable for one to four year olds. 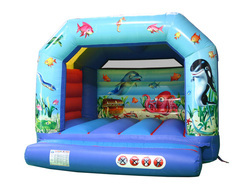 This is our only bouncy castle with an open top and is suitable for both in and outdoors. It is semi enclosed for added safety. £60 per day within 15 miles of Perth. £75 per day more than 15 miles of Perth. ﻿£30 extra for overnight hire. 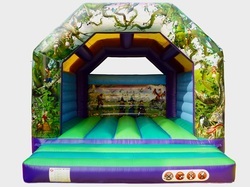 Our most popular Bouncy Castle! A Perfect fit in most of today's gardens and a party favourite! 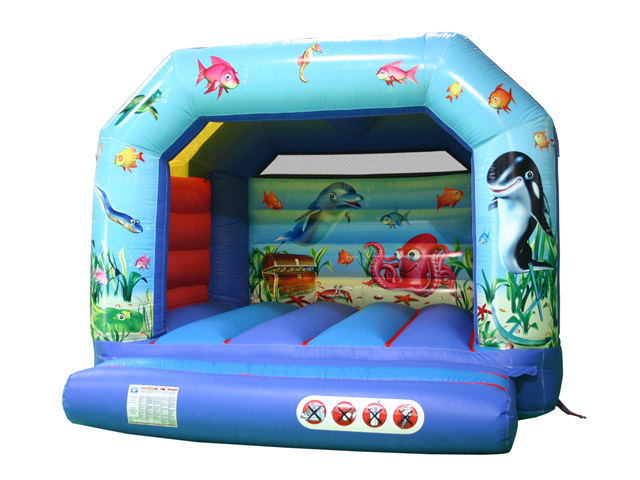 Fully featured Bouncy Castle with sewn in shower cover, deep bounce bed, netted open areas, superb digitally printed artwork in an exciting Undersea theme. £70 per day within 15 miles of Perth. £90 per day more than 15 miles of Perth. A real party favourite. 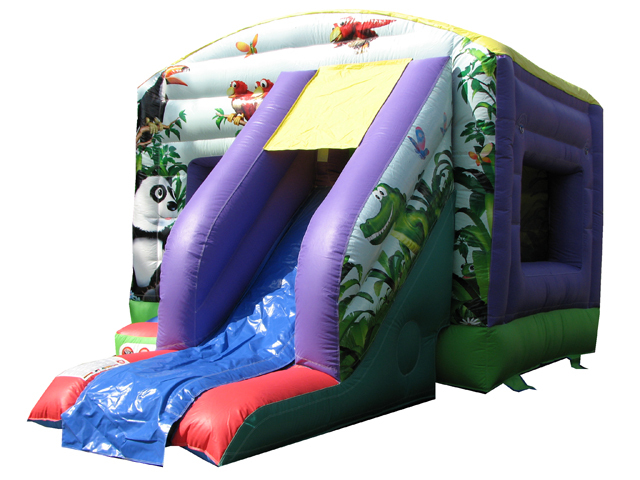 This bouncy castle provides children with a large bounce area and the excitement of a slide. Our front slide bouncy castle enables this inflatable to be used in a higher proportion of back gardens than a slide side equivalent. A fully featured Bounce and Slide Combo with sewn in shower cover, deep bounce bed, netted windows, superb digitally printed artwork in an eye catching Jungle theme, fully webbed bed and step and removable slide sheet. A real party favourite. This bouncy castle provides children with a large bounce area and the excitement of a slide. Our front slide bouncy castle enables this inflatable to be used in a higher proportion of back gardens than a slide side equivalent. A fully featured Bounce and Slide Combo with sewn in shower cover, deep bounce bed, netted windows, superb digitally printed artwork in an eye catching Celebrations theme, fully webbed bed and step and removable slide sheet. £90 per day within 15 miles of Perth. £105 per day more than 15 miles of Perth. A specially reinforced Adult Bouncy Castle for use at larger Children's parties or can be hired for Adult use. Fully featured Adult Bouncer with sewn in shower cover, deep bounce bed, netted open areas, superb digitally printed artwork in a magical Fantasy theme. ﻿£90 per day within 15 miles of Perth. Fully featured Adult Bouncer with sewn in shower cover, deep bounce bed, netted open areas, superb digitally printed artwork in a fantastic Circus theme. £30 per day within 15 miles of Perth. This ball pit comes with 4000 multicoloured balls. They are sanitised after each hire with Dettol. The ball pit features cones on either edge that have a blowing function that allow the placed balls to hover in mid air. This is a great addition to a party for smaller children that may not want the jostle of a regular bouncy castle. We stress that constant adult supervision is provided as these balls could constitute a choking hazard. Now only £50 per day within 15 miles of Perth. Now only £75 per day more than 15 miles of Perth. 5 x 5 metre inflatable gazebo. This massive inflatable is mainly used as a catering tent for serving food and drinks at larger events but can be used as a fancy gazebo. Other uses include a first aid tent, announcers tent or for fair type games. There is also a built in rain cover for light showers as the top is made from umbrella material. £5 each with any bouncy castle hire. Generators are only free when required with an inflatable hire. All you pay for is the petrol you use. If an extra generator is required to power an item not belonging to us then we charge £10 plus the cost of petrol. Hire this mini two-stroke generator with dual floodlights where there isn't an available power outlet. The lights are 500 watts each and provide a very bright light for outdoor events. The generator has a 800 watt nominal output and may be hired seperately for £10 per day plus the cost of fuel. If you have already hired an inflatable, the generator and floodlights are only £5 plus the cost of fuel. We guarantee to beat our largest competitor by offering you the same quality inflatables (when available) at the lowest possible prices.” Half day prices are the same as full day prices. This is because our full day prices are already heavily discounted. Safety is one of our priorities which is why every fan is still under guarantee or has been PAT tested. All our portable appliances are tested every 12 months for electrical safety by A1 PAT tester. We also use RCD safety circuit breakers on every 240 volt electrical supply. This means that if the fan were to malfunction or something cut through the lead for example, the current would immediately be disconnected at the plug without affecting your own electric circuit. Should it rain on the day and you would like to cancel your hire please phone us as soon as possible before we have the inflatable set up. There is no charge for this. If we arrive at your venue and there is nobody there, you will be immediately charged £40 to cover our fuel and wage costs. (Yes, some people do do this) Extra sums incurred will be added to this via our debt collection agency. All our inflatables come with a built-in roof for light showers. Should heavier rain persist we ask that you turn off the fan at the wall and turn it back on when the rain passes. This is obviously not possible with a marquee so if a garden table or similar is positioned over the fan it could be left running. This is to avoid the rain from being sucked up by the fan and blown into the inflatable. IMPORTANT: Although rain is expected on our inflatables please DO NOT pour bucket loads of water on or inside them. By doing this it means that we would need to wait for a dry day so that we can dry and clean the inflatable with towels and let it run for over an hour so that it dries out all the seams. You wouldn't want to hire a wet smelly inflatable so please don't expect others to. This is included on our disclaimer which has to be signed on every hire. Anyone who doesn't abide by this will be charged for an additional hire as the bouncy castle would not be able to be hired out for at least a day. Please download the following to read the terms and conditions. You will be provided with a copy on the day of hire to sign which includes the disclaimer. We accept **Visa, Mastercard, American Express and most debit cards. This is done via iZettle. (To see website click here.) We also accept **Paypal payments. **The charge on card payments is 2.75% of total bill. Paypal payments are only accepted on hires £100 and over. Please note that card payments are made on the day of the hire whereas Paypal payments need to be received three days before the hire to ensure funds have been cleared. See how quickly two popular bouncy castles inflate.